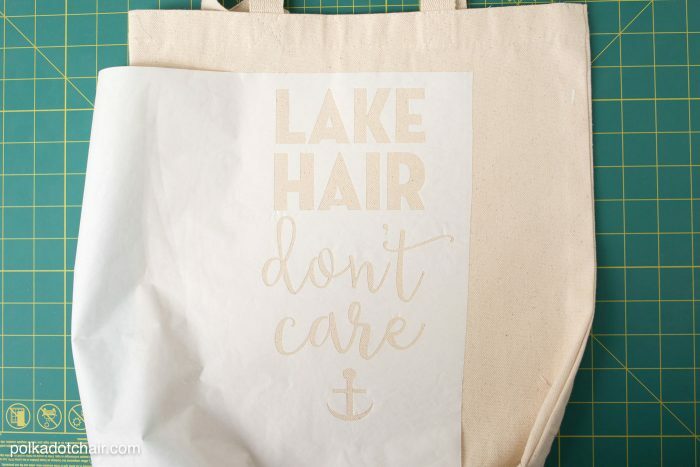 Today I’m excited to be sharing a tutorial for this Lake Hair, Don’t Care DIY Stenciled Tote Bag. I’ve mentioned before that I live in Kentucky and we are lucky to have many amazing lakes in our state. Our personal favorite is Lake Cumberland. It’s a few hours from our house but we love to “steal away” down there whenever we can. 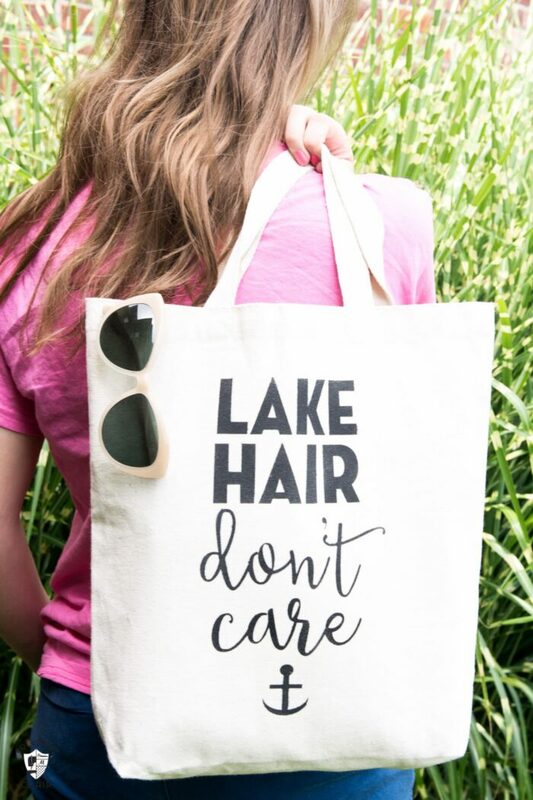 The last time we were there I spotted a t-shirt that said “Lake Hair Don’t Care”, I totally wanted to buy it but they didn’t have it in my size. At the time my hair was pulled up into a ponytail and hidden under a hat so the phrase seemed absolutely fitting. 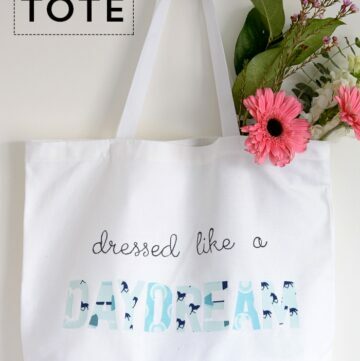 I decided that I’d make a fun tote bag with the saying instead of getting the t-shirt. 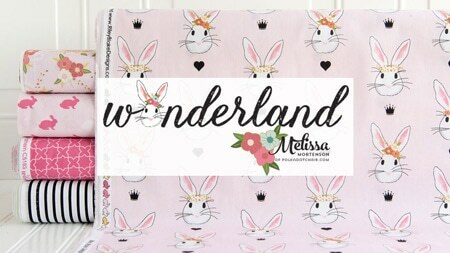 I designed a .svg file to go with it that you can download for free on my site then upload into your ecutting machine software. Begin by uploading the .svg file into your cutting machine software. Download it HERE for free. Cut a piece of freezer paper to 12×12 and attach it to a cutting mat (I think the light touch mat works the best for freezer paper). 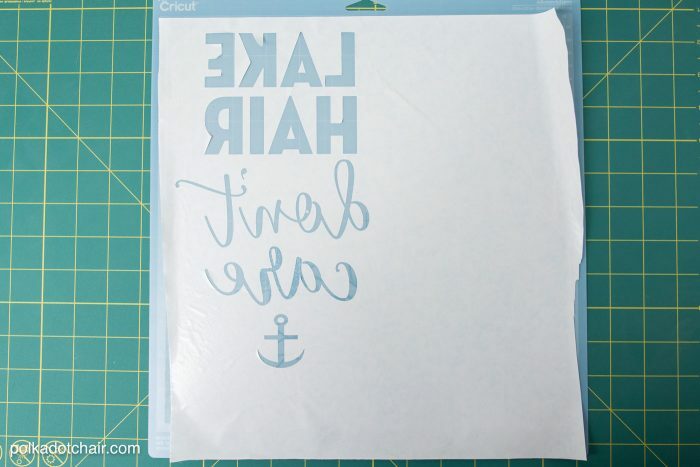 If you’re using a Cricut machine, click on all the layers and then click “attach” so they all cut as one piece. Size the image then click – send to the machine. Click “reverse” to mirror the image. Load your cutting mat into the machine. 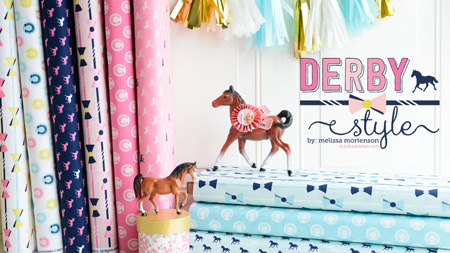 The shiny side of the freezer paper should be facing up. 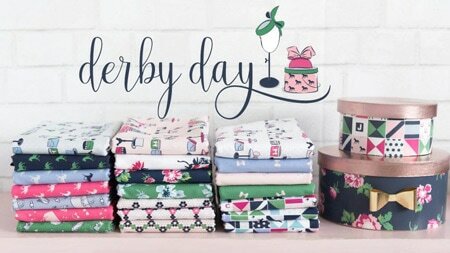 Cut using the “paper” setting on your machine. 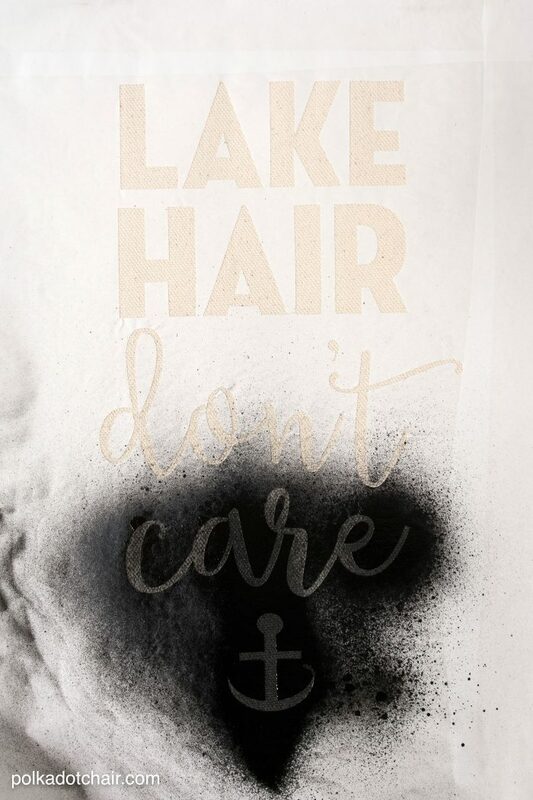 Next, peel away the letters leaving only a “stencil” of your image. Carefully peel the stencil away from the cutting mat. 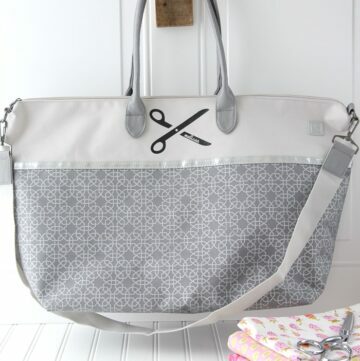 Center the image on the tote bag and iron it onto the bag, shiny side DOWN. Remove the insides of the letters from the cutting mat also and iron them into the correct spots on the image. 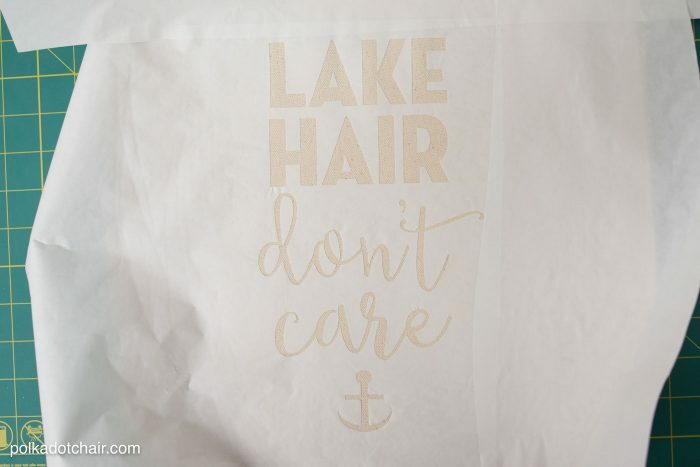 Add extra freezer paper to the sides of the stencil so that the entire bag is covered. Also iron one piece of freezer paper to the inside of the bag. 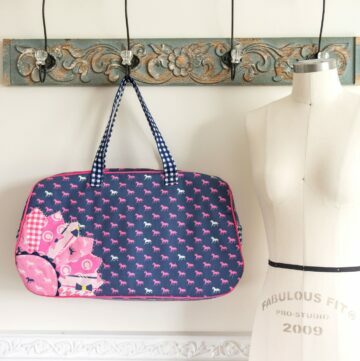 Using your fabric spray paint, lightly coat the bag. Spray evenly and do not over saturate the bag, or the paint will bleed. 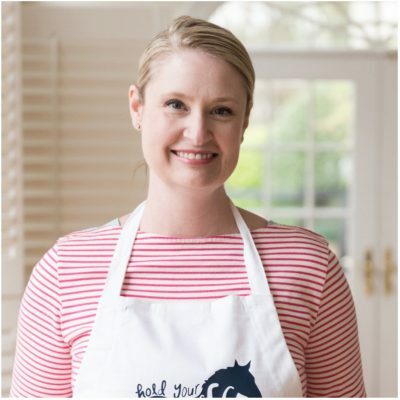 Remove the freezer paper and VOILA! 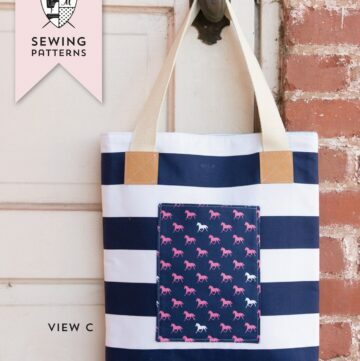 You’ve got a custom tote bag! 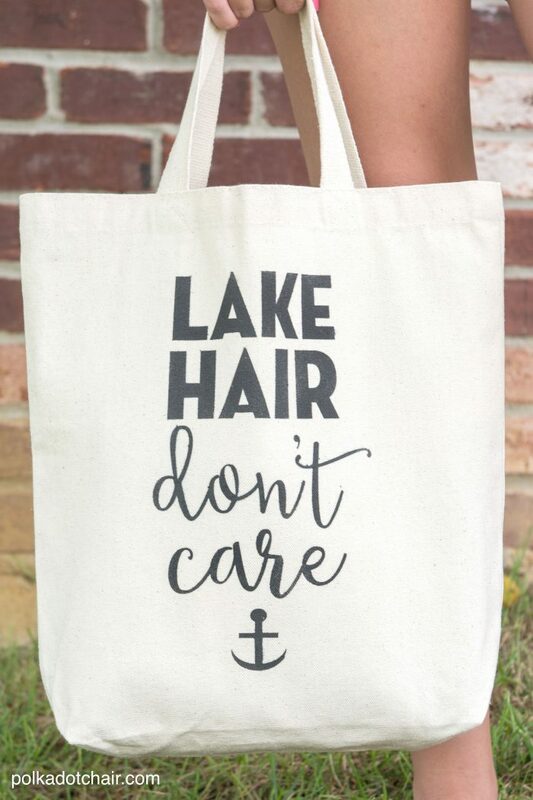 Enjoy it on your next trip to the lake!! Also, don’t have a lake close by? 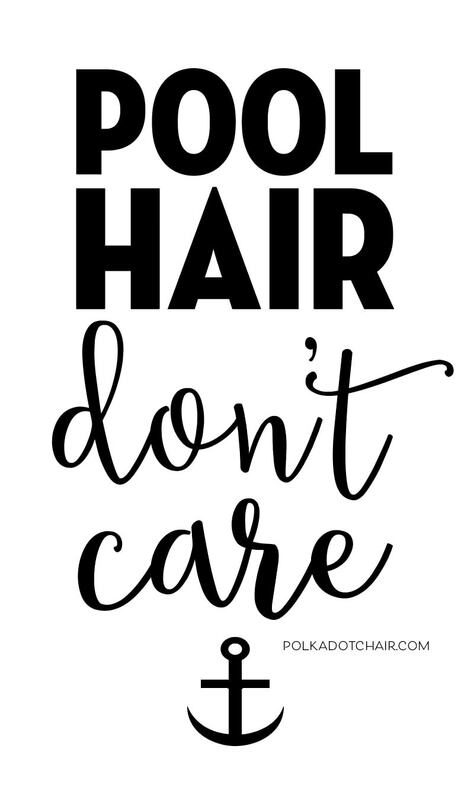 I’ve also created a “Pool Hair Don’t Care” file for you too. 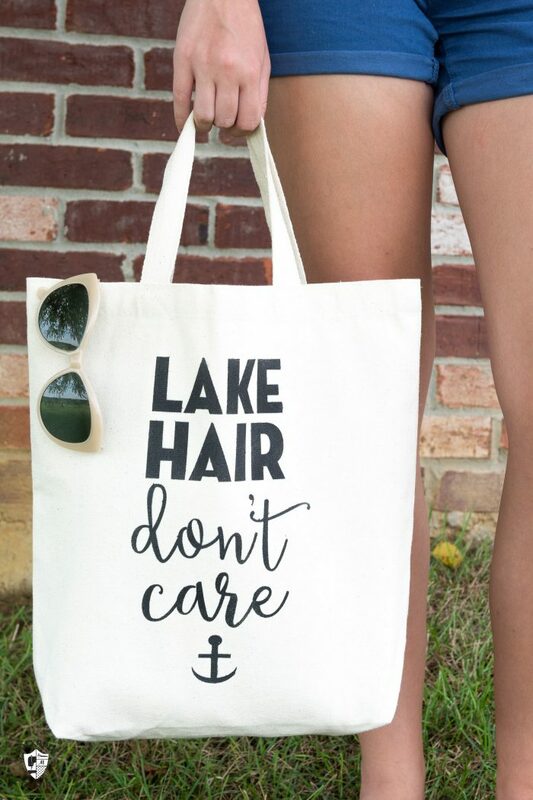 Could you possibly create one that say Beach Hair don’t care? 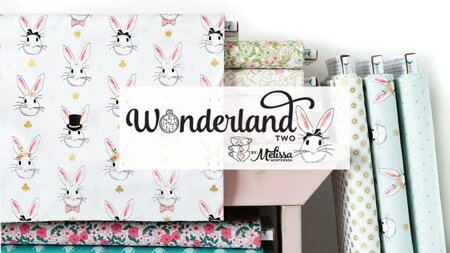 What fabric spray paint do you recommend? I LOVE this! 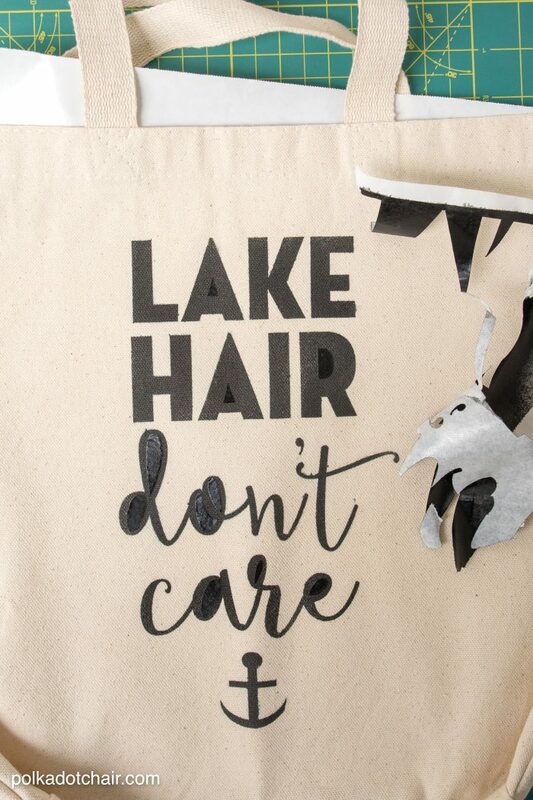 As a lake lover with long and thick hair, this is a common theme for me. 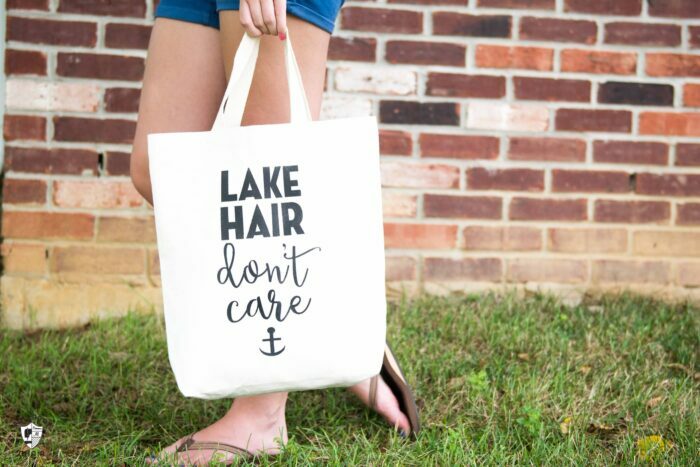 I’m always wearing it in a messy braid or big topknot, and this bag would be the perfect accessory!